As in early Mercury and Gemini manned flights, stress was laid on engineering and operational qualification rather than on experiments - whether medical or scientific. In December 1966, with only 9 experiments assigned to AS-204, 30 operational functions had a higher priority. And even then Slayton complained that the crew was not getting enough time in the new simulation and checkout facilities because of the experiments. Despite his arguments, the second Apollo crew (Walter Schirra, Donn Eisele, and Walter Cunningham, with Frank Borman, Stafford, and Collins as backups), announced on 29 September, was scheduled for a heavier workload of experiments.51 As technical troubles came to the fore, however, emphasis on experiments shifted. Command module 012 and service module 012 in workstands at the North American Aviation plant, Downey, in 1965. The chart shows the factory checkout workdays (1966). CM-012 - "Apollo One"- arrives at Kennedy Space Center, 26 August 1966. 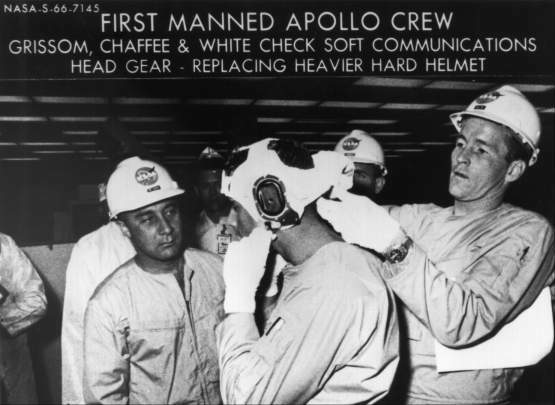 Astronauts Grissom (left), Chaffee, and White check the communications headgear in preparation for what was to have been the first manned Apollo flight - Apollo-Saturn 204, scheduled for 21 February 1967. Getting the spacecraft to the Cape did not really improve conditions. The environmental control unit needed to be replaced again, which held up testing in the vacuum chamber. AiResearch shipped the new unit from its West Coast plant to Kennedy on 2 November. Within two weeks, it was installed and testing was begun. It was then returned to California for further work. By mid-December, the component was back in Florida and in the spacecraft. 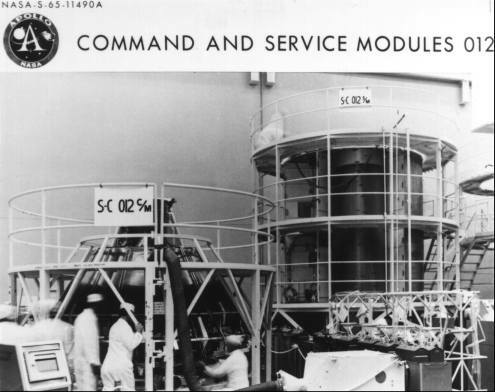 Meanwhile, the service module had been waiting in the vacuum chamber for the command module. While it was sitting there, a light shattered, and falling debris damaged several of the maneuvering thrusters.54 But this was not the only cause for worry about the service module. On 25 October at the North American factory, the service module for spacecraft 017 was undergoing routine pressure tests of the propulsion system's propellant tanks when the tanks suddenly exploded. No one was injured, but North American and NASA engineers were baffled as to the cause for the next few weeks. The tanks had not been overpressurized, test procedures had not been relaxed, and no design deficiencies were apparent; yet the fuel storage tank had failed with a bang. Since the service module for spacecraft 012 had been through identical tests, Shea was vitally concerned with unraveling this riddle before Grissom and his group flew. In early December, NASA reluctantly surrendered its plans for launching the first manned Apollo flight before the end of 1966. Mueller and Seamans then reshuffled the flight schedule, delaying AS-204 until February 1967 and scrubbing the scheduled second mission. Experimenters who had planned to place their wares aboard Schirra's spacecraft were brushed aside. Following AS-204, NASA planned to fly the lunar module alone and then a manned Block II command and service module, No. 101, in August 1967 to rendezvous with unmanned LM-2, the LM being lofted into orbit by a Saturn IB in a mission dubbed AS-205/208. After all this flight shuffling, the Apollo program seemed to be in fair shape at the end of 1966. 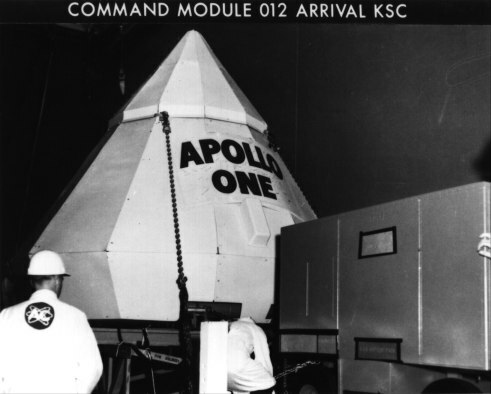 North American had finished the last of the manufacturing work on the earth-orbital version of the command and service modules on 16 September and could now concentrate on improving the lunar-orbital spacecraft.58 The lunar module still had problems, but Grumman was making headway in resolving them. The pathway to the moon appeared to be clearing, as NASA stood on the threshold of Apollo manned space flight operations. * NASA announced 21 March 1966 that these three astronauts would fly the first manned Apollo mission. 50. William Lee memo, "Initial Mission Directive for Mission 204," 29 Jan. 1965; Maynard to Apollo Trajectory Support Off., "Revisions to Apollo Mission 204A objectives and mission requirements," 22 April 1965, with enc. ; John H. Boynton to Asst. Dir., Flight Ops., "Definitions for various mission profiles," 4 Aug. 1965; TRW Systems, "Mission Requirements for Apollo Spacecraft and Saturn Launch Vehicle Development, Mission Apollo Saturn 204B," 2132-H001-RU-000, 3 Sept. 1965; MSC, FOD, "Apollo Flight Operations Plan: AS-204A," 1 Dec. 1965; NASA, "Mission Operations Plan, Apollo-Saturn 204," OMSF mission operations directive 4, M-D MO 2200.019, 7 Dec. 1965; Shea memo, "Back-up Missions for Apollo," 12 Jan. 1966; anon., mission 204B outline notes, 14 April 1966; NASA, "Apollo Program Flight Mission Directive for Apollo-Saturn 204A Mission," OMSF Apollo program directive 20, M-D MA 1400.043, 15 July 1966; MSC, "Gemini and Apollo Crews Selected," news release 66-20, 21 March 1966. 51. Abstract of Meeting on Experiments for the Apollo AS-204 Mission, 12 May 1966; EXPO, "Apollo Earth Orbital Experiments," 1 Aug. 1966; Hodge memo, "Flight Control Experiments Operations Plan for AS-204," 18 Oct. 1966, with enc. ; Maynard memo, "Objective Priorities for Mission AS-204," 23 Dec. 1966; Slayton memo for Mgr., EXPO, "AS-204 Medical Experiments," 20 Jan. 1966; NASA, "Second Crew Named for Apollo Flight," news release 66-260, 29 Sept. 1966. 52. MSC, CSM CEB, "C and SM Schedules Engineering Report," 19 Aug. 1966; Lanzkron memo, "NAA CARR Action Responses - CSM 012," 4 Oct. 1966, with encs. ; Brig. Gen. Carroll H. Bolender to Phillips, NASA routing slip, with enc., Bolender memo for record, no subj., 11 Oct. 1966; Lanzkron to Mgr., ASPO, "EO's on Spacecraft 012," 8 Nov. 1966. 53. Riley D. McCafferty, interview, Cocoa, Fla., 15 Nov. 1969; Slayton to CSM Contracting Officer, "Acceptance of Apollo Mission Simulator No. 2," 12 Aug. 1966. 54. Edward R. Mathews and Hugh E. McCoy TWXs to NASA Hq. et al., "Daily Status Report, AS-204, dated October 27, 1966," 28 Oct. 1966, and "Daily Status Report, AS-204, dated October 28, 1966," 29 Oct. 1966; Lanzkron TWX to KSC, Attn. : Maj. Gen. John G. Shinkle, 28 Oct. 1966; Phillips to Assoc. Admin., NASA, "CSM ECS Status as of 28 October 1966," 1 Nov. 1966; Phillips to Mueller, no subj., 1, 2, and 15 Nov. 1966; James F. Saunders, Jr., to Chief, Apollo Spacecraft Test, "012/AS-204 KSC activity for 12/16/66," 16 Dec. 1966, with annotations by Phillips and LeRoy E. Day, 18 Dec. 1966. 55. Markley to NASA Hq., Attn. : Phillips, "ASPO Weekly Project Status Report to MSF," 26 Oct. 1966; Frank J. Magliato, NASA Hq., note to Webb and Robert C. Seamans, Jr., "Test Failure of Service Module 017," 26 Oct. 1966; Robert R. Ridnour, MSC, RASPO-Downey, TWXs to MSC et al., "Status Report Number One, Test Failure Investigation of SM 017," 27 Oct. 1966, and "Status Report Number Two, Test Failure Investigation of SM 017," 28 Oct. 1966; Shea TWX to NASA Hq. et al., "Interim Problem Bulletin (Telegram)," 2 Nov. 1966; Lanzkron TWX to KSC, Attn. : Chief, Manned Spacecraft Off., 14 Nov. 1966; Lanzkron TWX to KSC, Attn. : Shinkle, 14 Nov. 1966; William M. Bland, Jr., MSC, RQ&A, to Mgr., ASPO, "Report on trip to KSC, November 14, 1966," 15 Nov. 1966; Shea briefing for Webb et al., [15 Nov. 1966]; Phillips to Mueller, 15 Nov. 1966; Shea to Kurt H. Debus, KSC, 25 Nov. 1966; anon., "Summary of Damage to SC 017 Service Module," [December 1966]; Shea to NASA Hq., Attn. : Phillips, "Test Investigation for Service Module 017 Tank Failure," 16 Feb. 1968; Joseph N. Kotanchik to Dep. Mgr., Apollo Reliability and Quality Assurance, "Preliminary Report by GAO on their look at S/C 017 Tank Failure," 4 June 1968; Bland to Mgr., ASPO, "Preliminary Report by GAO on their look at S/C 017 Tank Failure," 7 June 1968, with enc., "Summarization of Audit Findings on Review of Explosive Failure of the Apollo Spacecraft 017 Service Module under the Apollo Program at North American Rockwell Corporation, Space Division," n.d.
56. Shea memo, "Design Certification Review for Spacecraft 012," 24 June 1966; Mueller to Gilruth, 2 Sept. 1966; Phillips letter, "AS-204 Design Certification Review," 12 Oct 1966, with enc. ; Phillips to MSFC, MSC, and KSC, Attn. : Lee B. James, Shea, and Shinkle, "AS-204 Design Certification Review," 20 Oct. 1966; Shinkle, KSC, to MSC, Attn. : Shea, 4 Nov. 1966, with encs. 57. Everett E. Christensen TWX, "MSF Mission Operations Schedule Forecast for November 1966," 18 Nov. 1966; Phillips TWX, ["Apollo Program Directive No. 4F (Interim)"], 16 Nov. 1966; Christensen TWX, "MSF Mission Operations Schedule for December 1966," 8 Dec. 1966; Shea to Phillips, 8 Dec. 1966; William O. Armstrong, interview, Washington, 24 Jan. 1967; [Mueller] to Seamans, "Apollo Program Adjustment," 7 Dec. 1966, with enc. ; NASA, "NASA Names Crews for Apollo Flights," news release 66-326, 22 Dec. 1966. 58. House Subcommittee on NASA Oversight, Pace and Progress, pp. 1137-1219.